Home > Headaches > Could My Headache Mean a Brain Tumour? It is a common worry for someone with bad headaches to think that they may have a brain tumour. But, although headache is one symptom that can be caused by a tumour within the brain, this is by no means always the case. 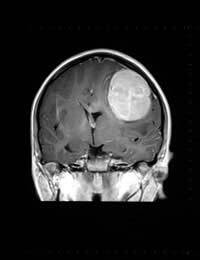 Some brain tumours cause no headache, or any symptoms at all until they are very large. It is more likely that other symptoms will be noticed as the tumour affects brain function before it grows sufficiently big to cause an increase in pressure in the skull. Chronic headaches, even those that cause visual disturbances, nausea and sickness are usually due to other factors, such as eye strain, food triggers, a sudden change in temperature, stress or anxiety or over consumption of alcohol. When headaches are very severe, or come on suddenly in someone who doesn’t normally have headaches and are accompanied by other symptoms, it is wise to seek medical advice. Severe headaches can be a sign of meningitis or subarachnoid haemorrhage, or other conditions that need urgent treatment. One of the most common symptoms of a brain tumour, which must be remembered is a very rare form of cancer, is fits. Twitching of the hand, a limb or the whole body can be regarded as a fit and attacks become more frequent over time. Blurring of the vision, seeing shapes floating in the eye, developing tunnel vision or experiencing a temporary loss of vision are also signs that a brain tumour could be present. Other symptoms of brain tumours are perhaps more surprising and depend on the site of the tumour within the brain. Different parts of the brain do different jobs, and damage to even a small area interferes with those specific functions. Tumours in the frontal lobe of the brain affect the personality, causing abnormal and uncharacteristic behaviour. Someone who is usually extremely organised, scrupulous about their appearance and well-spoken can suddenly become apathetic, incapable of organising anything and wear dirty and mismatched clothes. One part of the face or one side of the body can become weaker than the other. It can become impossible to smell anything and the affected person can lose the ability to speak coherently. Tumours of the temporal lobe lead to a loss of short term memory and fits. These are often accompanied by smells or sounds or strange feelings, such as a feeling that you have a distant memory of something, or have been somewhere before. This is commonly called deja vu. If the parietal lobe is affected, if can become impossible to understand what someone is saying, or to respond and the affected person is unable to read or write. Sight problems are more common with tumours in the occipital lobe. Tumours that occur on the spinal cord generally cause pain but this tends to be in the parts of the body that are served by the nerves that lead from this part of the spine. Numbness is also a common feature of spinal tumours, with weakness developing in the arms and legs. The affected person can also lose the ability to control the bladder and bowel and become incontinent. In the UK, 13 000 people are diagnosed with brain tumours in any given year. Around 5000 of these people have primary brain tumours – which means that their brain tumour is a cancer that has originated in the brain, rather than a metastatic tumour that has spread from a cancer elsewhere in the body. Brain tumours are serious and they have a low survival rate but it is important to keep things in perspective. Over 9 million people in the UK suffer from migraines each year – and that is only one type of headache. The chances that your headache is caused by a brain tumour are very low. Rather than worrying about having a brain tumour, it is better to talk to a GP and discuss the possible causes of chronic headaches to try to avoid triggers and situations that cause you problems. Relaxation, avoiding specific foods, getting the correct glasses and using good lighting for work can all help. Hi I am 30 years old women I have been suffering from a headache since last Last 14 years it started with a migraine but now day by day it has been getting Worse I go to slp with a headache and wake up with it it's pressure in My head throbbing pain I am sick and tired of it. I get it aeast 5-6 times A week and now pain just stays in two parts of my head like pressure. I have been takeing amitriptline 100mg twice a day I am always buzzing I have just been For a MRI scan and they found two illusion lumps iny head I am so worried One is 13mm and the other one is 4 mm they hav referred me to a neorologist But I'm really worried please help me .